Teams have enjoyed another productive morning at Barcelona, with the sun omnipresent at the Spanish track. After a chilly morning, many drivers tried out the super soft and ultra soft tyres, but eventually it was Lewis Hamilton who got the headlines, seeing his W07 stop on track for the first time in winter testing. The session kicked off with Sebastian Vettel going out on track with the Halo device fitted on his car. Just like Raikkonen on Thursday, Vettel wanted to get a feel for the visibility with the proposed safety device. The German returned to the pits after a single lap, following which Ferrari went on with their normal programme. Overnight, the device has received many reactions, with very different opinions. Lewis Hamilton said "it was the worst mod in F1 ever", while Nico Hulkenberg was also against, saying the level of safety is acceptable as it is right now. 10 minutes into the session, all teams had completed at least one lap, except for Manor, who struggled with a mechanical issue and eventually were not out on track during the entire morning session. A lot of drivers have tried Pirelli's ultra soft and super soft tyres during the morning session, with Vettel going atop the timesheet on a set of super soft tyres, 8 tenths quicker than a time set 15 minutes earlier on the soft tyres. The German went out on the ultra softs a bit later, and recorded the best S1 of testing so far, only to drop off in S2 and S3, probably taking too much out of the tyre. Meanwhile, Sainz also set a personal best on the super softs, ending less than 3 tenths down on Vettel's best on the same compound. Pérez' time, another half a second further down, was similarly set on the super softs. There were generally little issues with the cars on track, but 8 minutes from the end of the morning session it was Lewis Hamilton who stopped on track with a transmission problem. After lunch, it was susprising that most teams initially did less laps than on previous days in testing. Manor's Rio Haryanto however managed to bounce back after being stuck in the garage for the entire morning, completing 58 laps. 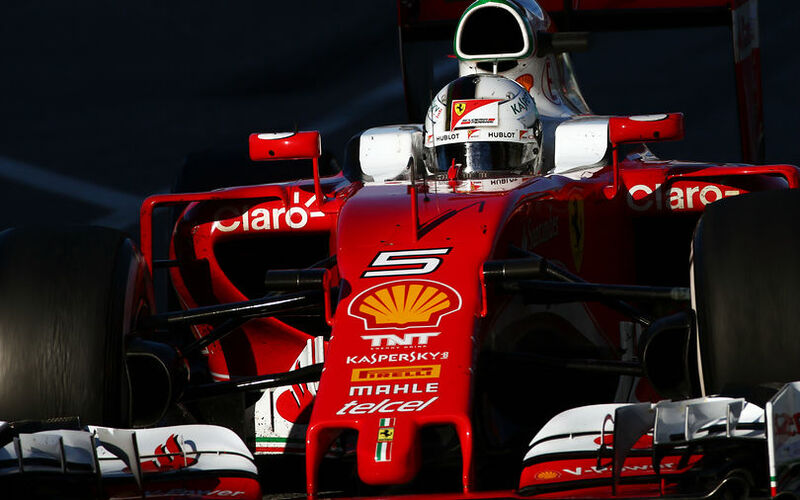 Still, Ferrari continued quite strongly, even though Vettel did not attempt to improve his earlier quick laptime. Instead, they focused on longer runs and ended the day with 142 laps, the most of any car. At Mercedes, it was a bit surprising to see the lack of speed from Rosberg. It appeared like the German was taking it easy following the team's transmission issue during the lunchbreak. In the end, as testing comes to an end, Carlos Sainz impressed most today, setting a time on the super softs that is just 4 tenths down on Ferrari's best on the same compound during the last 8 days of testing. Teams are now set to leave for Melbourne, when in just 2 weeks time, the Australian Grand Prix is set to be held.